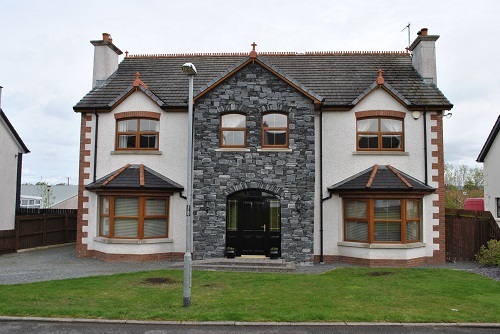 Superb Detached, Two Storey Dwelling Extending To Approx. 2900 Sq. 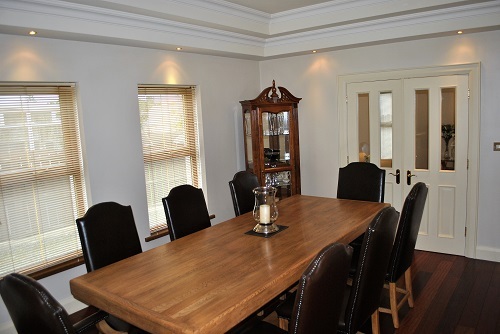 Ft, Finished To A Very High Standard And Very Well Presented By Current Owners. 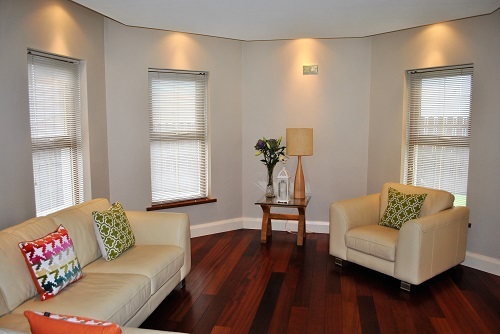 Four Reception Rooms Including; Living Room, Family Room, Dining Room And Sun Room.Four Excellent Bedrooms Plus Study, Master With Ensuite Bathroom And Dressing Room And Second Bedroom With Ensuite Shower Room.Luxury Bathroom Comprising 'White' Five Piece 'Designer' Suite With Feature Tiling To Walls And Floor.Bespoke Kitchen With Superb Range Of Handcrafted Units With Granite Worktops And Porcelain Tiled Floor.Utility Room With Excellent Range Of Units And Ground Floor Toilet To Rear Porch.Oil Fired Central Heating System , Double Glazed Windows In Upvc Frames, Feature Integral Doors, Bison Precast Floors, High Quality Tiling To Walls And Floors, Solid Walnut And Oak Floors. Please contact me about 7 Ardcairn. 21'0 x 13'8 Hardwood front door with double glazed side and top fan lights. Porcelain tiled floor ornate ceiling. Cloakroom. Feature half turn staircase. 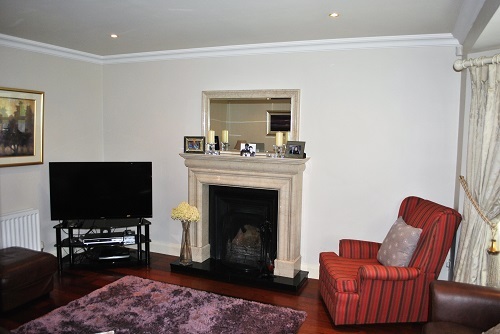 16'0 x 12'4 Contemporary Italian marble fireplace with cast iron open fire and granite hearth. Large bay window. Solid walnut floor. Ornate ceiling cornicing. Recessed lights to ceiling. 16'4 x 15'2 Open fire. Solid walnut floor. Large bay window . Ornate ceiling cornicing recessed lights to ceiling. 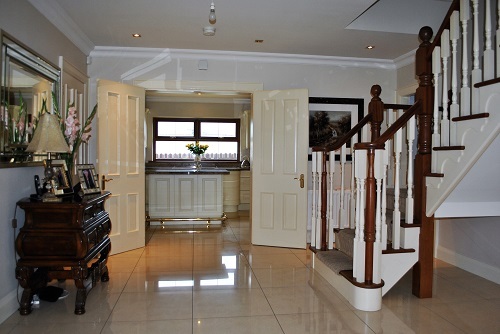 Double doors leading into hallway. 16'2 x 11'8 Solid walnut floor. Ornate ceiling cornicing and recessed lights. Steps leading up into kitchen area with Led lights. Double doors leading into Sun Room. 14'8 x 13'6 Solid walnut floor. Feature drop ceiling with recessed lights. French doors leading out into rear garden. 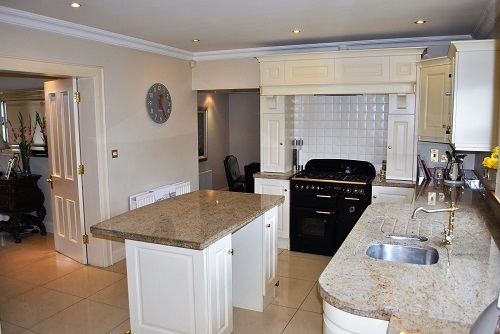 17'6 x 12'0 Superb Bespoke kitchen with handcrafted units and granite worktops with splashbacks. Stainless steel one and a quarter bowl sink unit with mixer taps. Part tiled walls. Porcelain tiled floor . Recessed lights to ceiling. Display units and wine rack. Ceiling cornicing. 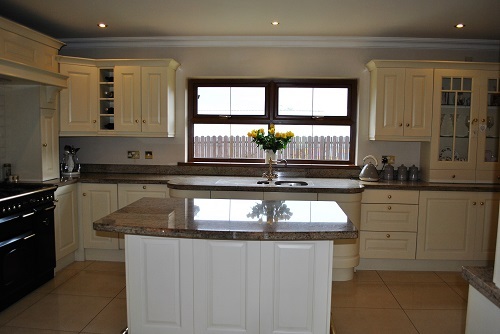 Feature centre island unit / breakfast bar with granite worktops. 6'0 x 4'2 Porcelain tiled floor. Hardwood rear door with double glazed centre light. 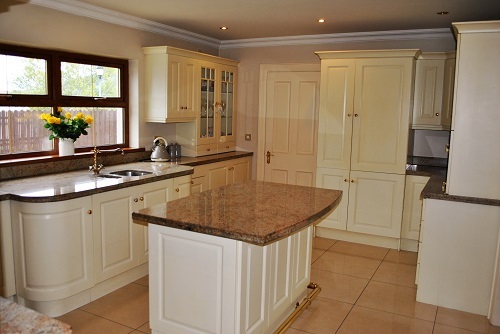 8'0 x 7'10 Excellent range of handcrafted units with matching worktops. Stainless steel single drainer sink unit with mixer taps. Part tiled walls. Porcelain tiled floor. Plumbed for washing machine. Ducted for tumble dryer. 5'10 x 4'2 White two piece suite comprising low flush w.c and pedestal wash hand basin. Porcelain tiled walls and floor. Ceiling cornicing. Recessed lights to ceiling. 9'0 x 7'0 Solid oak floor. Recessed lights to ceilings. Ornate ceiling cornicing and recessed lights walk in hotpress / airing cupboard. Walk in storage cupboard with access to loft. Loft approx. 900 Sq ft with flooring and velux windows installed which can allow for further accommodation. And Ensuite Bathroom - 14'10 x 12'8 Ceiling cornicing and recessed lights. Excellent range of built in sliding robes. Porcelain tiled floor. Recessed lights. 8'4 x 6'0 White three piece suite comprising inset bath with central mixer taps and shower over bath. Walnut vanity unit power with wash and basin , drawer sets and wall unit with mirror and display shelving. 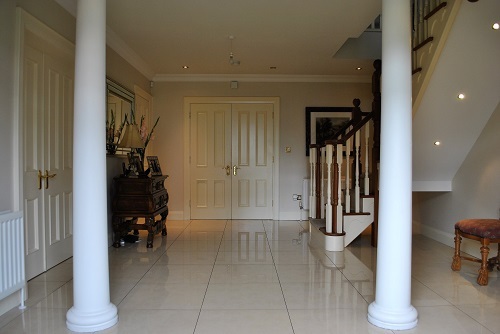 Porcelain tiled walls and floor. Recessed lights to ceiling. 13'4 x 11'8 Excellent range of built in sliding robes. solid oak floor. 5'10 x 5'4 White three piece suite comprising corner shower unit with power shower. 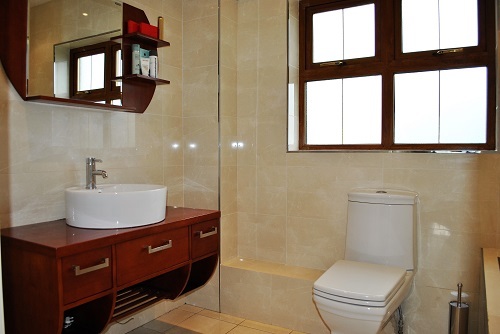 Pedestal wash hand basin and Low flush w.c. Good quality tiling to walls and floor. Recessed lights to ceiling. 14'10 x 11'2 Excellent range of built in sliding robes. Solid oak floor. 14'0 x 11'6 White five piece 'Designer' central mixer taps and shower attachment. Low flush w.c. 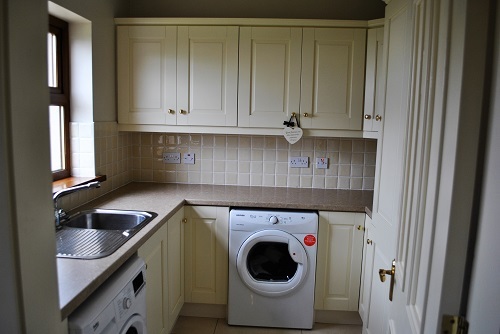 Feature vanity unit housing twin wash hand basins open shelving and wall mirror with recessed spotlights. Step in shower unit and drying area with overhead rain shower. Fosil tiling to walls and floor. Recessed lights to ceiling. Chrome heated towel rail. Front garden laid out in lawns and shrubs with driveway to side providing excellent parking space. Rear garden laid out in lawns, with paved patio area, enclosed by timber fence. Boiler house. Pvc oil tank. Outside lights and water tap. 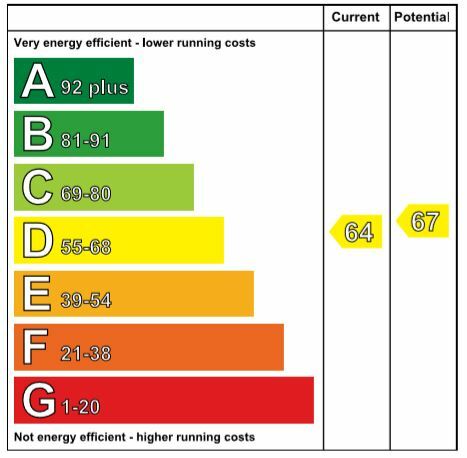 £1427.94 Per annum as at September 2018.